On thiruvadirai star of Margazhi month, Kali and ezhu kari kootu is made and offered to the Lord and consumed as prasadam. Ezhu kari kootu should have atleast 7 vegetables in it. Though it is named ezhu kari kootu, we end up with more than 7 vegetables. Vegetables like ash gourd, pumpkin, raw banana, colocasia, broad beans, fresh field beans(is a must), yam, cluster beans, sweet potato, snake gourd etc. are used. 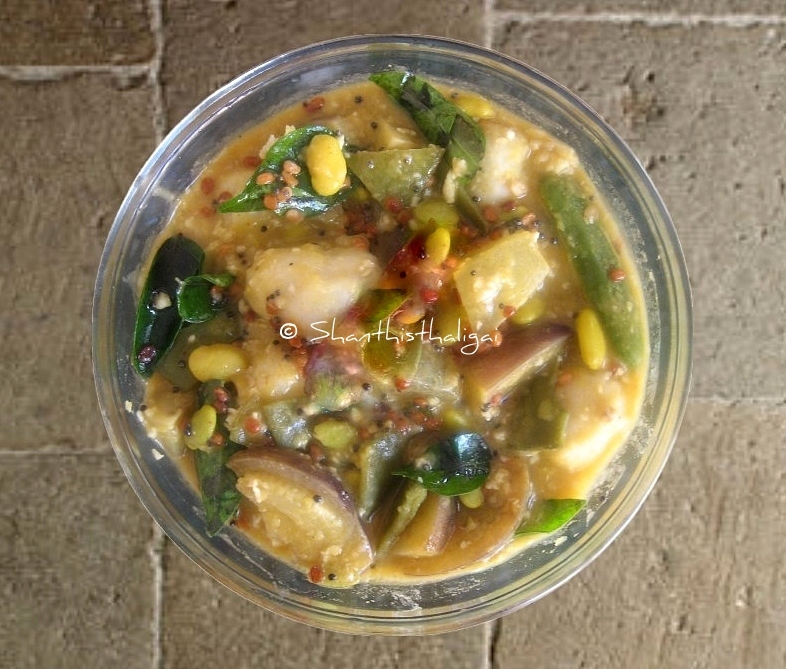 The seasonal vegetables during this time is kavathankizhangu ( I think it is pidi karunai in Tamil) and koorkankizhangu (chinese potato), which gives a great taste to this kootu. Usually odd number of vegetables like 7, 9, 11 etc. are used. It is customary, vegetables like drumstick, ridge gourd, radish, capsicum and bottlegourd, needless to say onions and garlic are not used in this kootu while doing on festival days. Traditionally, beans, carrot and potatoes are also not used. However, you can use any vegetables while doing it on other days. Parangikai (Pumpkin) - 50 gms. Bengal gram - 1 tsp. Methi seeds - 1/4 tsp. Pressure cook toor dhal with turmeric , mash well and keep aside. Cook colocasia, peel and keep aside. Extract pulp from the tamarind. Cut ash gourd, pumpkin and raw banana to big cubes. Cut other vegetables to finger-long pieces. Slit green chillies. In a pan, heat a teaspoon of oil and add the items given in the list" To Powder" and fry until golden brown. When cool, add coconut and powder coarsely OR grind to a coarse paste, in a mixie. Keep aside. In the same pan, heat the remaining oil , add mustard seeds , slit green chillies and curry leaves. Then add all the vegetables, turmeric powder and stir fry for 2 minutes. Add required amount of salt, pour in 1/2 cup of water and cover it with a lid. When half done add the tamarind extract and let it boil until the raw smell of the tamarind goes. Now add the mashed dhal, mix well and allow it boil until cooked. Add the ground powder, mix well and bring it to a boil. Best with Thiruvadirai Kali.